Toyota trains over 200,000 people per year in its four connected Training Rooms. Mechanics come in from all over the world to learn how to be a master mechanic with Toyota Forklifts. Toyota is the world’s largest makers of forklifts, and its training program is legendary in the industry. Toyota called in Ultimate Automation because it felt that its technology in these training rooms was lagging behind the times. In addition to training, they also used the rooms for large, important meetings both for internal and external purposes. It was more than once that the technology had “quit” on them during one of these meetings. Make the rooms extremely reliable to ensure no more breakdowns. Upgrade video and audio quality to today’s standards. The rooms should encourage collaboration due to the type of training that occurs in them. There was a desired “wow factor” that Toyota wanted to have when people entered the rooms. Crestron processors and peripheral equipment was used to accomplish the reliability feature. Four NEC video walls were installed. 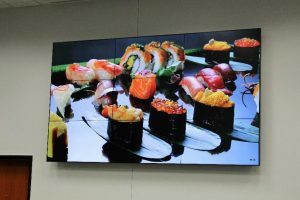 The first two were 3X3 55-inch TVs producing a combined 165-inch video wall. These were used to “wow” people when they arrived and produce a much higher-quality picture quality for presentations and videos. The second two video walls were 2X2 55-inch TVs with collaborative touch screens, producing combined 110-inch video walls that could be used to facilitate training and discussions. Crestron speakers were used to upgrade the audio quality, along with Crestron sensors to open and close the divider walls that stood between the four rooms. Altogether, Toyota now has control of all technology in the rooms, along with programmed scenes to make the technology work together when it was time to start training. They held their next large meeting, and the issues that has plagued this space were gone.